Should we be taking a second look ? A line from Atul’s diary struck a chord – What’s so cool about free software ? . Till now all the activity that has been done across the country (the roadshows, the install fests, the demos and the LinuxAsias) have been based on the premise that FLOSS is cool and the devotees will flock to the temple. When we talk about FLOSS in education, perhaps it is worth a second look towards how we go about it ? Educational institutions are about service delivery. Forgive the crude way of putting it across, but if you strip away all the frills – you get service and the branding that the institutes obtain could be the quality assurance tied in with the delivery of such service. In such a situation, creation of a matrix of FLOSS around the system would be a bit more complex. The current approach revolves around finding a best-fit software tool for the education business process. This includes Institution Management software (school, college, campus), Portal for the institute (along with necessary frills like IM, Single Sign On etc), Laboratory Management Software, Digital Library Information Services Software (Koha for the brave and others for the mere mortals). This would of course lead to a more streamlined engagement with the developers. Only because we might see the need to develop software in house. Small example, any currently available Learning Management System if deployed directly in an Indian set up would fail to make an impact. Primarily because the course content is not on-line (or even in a state of being able to be ported online) and secondarily because the grading and examination processes are different. Then again we have to consider the need of different education boards in the country. If you notice carefully, we have travelled down a rocky path till now. We began with the assumption that the current way of providing FLOSS for education is not proper and ended up with the real need to motivate developers to create applications or add functionality to existing applications. For example, a software like DrGeo would do pretty well if advanced mathematics modules aimed at standard 10,11 and 12 are added to it. Using that in conjuction with Octave, R and gnuplot would enable the creation of a complete tool set of educational applications for mathematics. And this is exactly what is lacking right now – the means to create modularised education stacks which can be plugged into a FLOSS based educational application framework. One framework for an entire board with modules being added at will to enable it to be re-used. Involving developers and academic world leads to another phenomenon – User Driven Innovation. In case of a education stack based on FLOSS, UDI is the only way to get it going. It will pull in developers of various skillsets interacting with maintainers of existing packages as well as ensure that a proper fit software is developed. I was reading through The Tipping Point again yesterday evening and what struck me was that it is time that community based Indic L10n needs to find its tipping point as soon as it can. The Tipping Point is an examination of the social epidemics that surround us.
. For a moment forget about the semantics of the word epidemic and concentrate on how little things can coalesce to bring about big changes. Around a year and a half back, Indic L10n was a mish-mash of teams racing against each other and time to achieve complete translation for the various desktop environments. Today it is time to consolidate those efforts into providing one little push that will go a long way in changing the scheme of things. With the release of the sub 10,000 INR desktop PC preloaded with Linux, the hardware vendors have clearly sent out a message that on the desktop, there are Linux applications which are complete in their own way. What needs to be put in place is an understanding of the most commonly used applications on the desktop and making them available in the currently active Indic Languages. One method of collating the information could be a wiki page on IndLinux. The idea would be to capture the localisation/translation status for applications as well as rendering and other known issues which could hinder their adoption on the desktop. How long does it take to open a Savings Account ? 6. We were advised that according to existing Reserve Bank of India circular, joint account opening applicants have to fill up a form for Blood Relatives, which curiously states that the Spouse is a blood relative. The original application form however defines a blood relative as father, mother or sibling. The fun part is that during the entire exercise, I was informed by Investment personnel about the stellar service record of ICICI, credit card executives talked about how ICICI credit card is one of the most popular cards. Wonder when will ICICI get its customer service act together – if this is the way existing account card holders get treated at one of the bigger branches, what will new account holders face ? Or this could also be why LinuxForYou needs to pull up itself by the bootlaces and get its act together. Time is changing and changing far too rapidly for this magazine to lose focus. On the fateful 26th (hereinafter known as The Flood), I met Alolita and Robert at the office. Sooner or later as it always happens the smalltalk veered towards LFY and how an uplift and a change of focus would be the order of the day. I had promised them that I will blog about it. Well, one month delay – but blog I did never the less. LFY appeared at a curious crossroads. PCQ after doing a lot of good for the FLOSS (and especially Linux as an OS) space, suddenly took its focus away from FLOSS to various aspects of the enterprise stack. Additionally, both CHIP and Digit were doing the now-you-see-us and now-you-don’t trick. The momentum built up by the LUGs on the back of PCQ needed a magazine that they could talk about in their monthly meetings, distribute. More importantly, they needed a medium which was tangible enough to take home to. LFY was the perfect gift. It had articles that assumed that a lion’s share of its readers will be doing Linux for the first time. Instead of trying to be many things to many people, LFY decided to be a single thing to a demanding audience. And it worked. Here’s hoping that the editorial team does take this as a request as soon as they can. 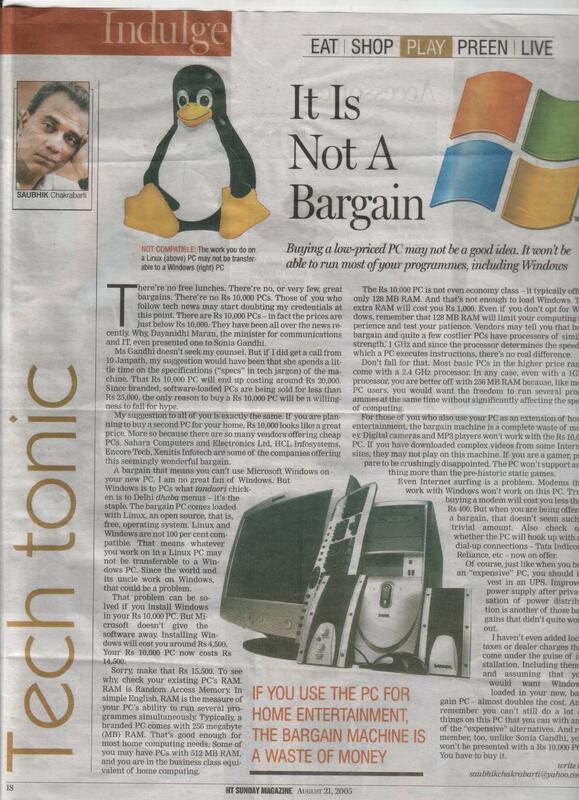 The HT Magazine in a recent issue (21st August 2005) carries a column by Saubhik Chakrabarti on the recent launch of low cost PCs by some of the vendors. The uniqueness of the low cost launch has been that all these sub 10,000 INR PCs/Desktops come preloaded with Linux. Saubhik argues that it is not a bargain and that sub 10K desktops end up costing much more in terms of upkeep and usage. The problem with the column is that it gets it wrong. Right at the beginning there is this nice blurb that the work you do on a Linux PC may not be transferable to a Windows PC. Around 2 years ago, this would have been readily agreed to. As of today, it is a trifle hard to believe. Given the large volume of desktop deployments, that particular argument will not hold water. The solution proposed is even more laughable. Install Windows on the PC. When Acer began to ship Linux pre-loaded laptops at very affordable prices, a large volume of the sale was driven by buy the laptop-upgrade the RAM-install Windows cycle. The entire notion of providing a sub 10K PC is to provide a computing environment that is complete. It allows the desktop to be used for SOHO purposes. That means practically allowing it to perform flawlessly through the entire spectrum of office applications, media applications, internet browsing, e-mailing, IM and what not as well as some fun and games. A completely sane installation of any Linux Operating System allows one to do the same. The column makes the same mistake again when it re-iterates that 128MB of RAM is much too less for Windows. But that is basically the point. Given the current price point of RAMs, spending another 2500 INR would provide the user with a sufficiently responsive desktop. And as the article goes on and on about how the PC will falter if one wants to use it as a home theater, one is inclined to believe that the author has not used (or perhaps even seen) a modern Linux desktop. Buying an Alto and then analysing why it will fail to carry Qualis kinds of performance is not the right way to review either hardware or software. Perhaps Saubhik would do well to put across his functional needs for a SOHO desktop and have someone demonstrate the same on a Linux machine. Mi primer PC…. ¡Pero de VERDAD! Even as we welcome the interest your administration has shown in developing the social program “Mi Primer PC” (My First PC, or MPPC), which aims to put computers within the reach of families with few resources, we feel that it is imperative to let you know of our objections to the terms by which this public-private initiative is being offered to the public. The LUGs are in demand at the LUG – Fedora Project Wiki. Go ahead sign up your LUG for getting involved. The Freedom Toaster is a conveniently located, self-contained ‘Bring ‘n Burn’ facility, where users bring their own blank discs and make copies of the open source software they require.